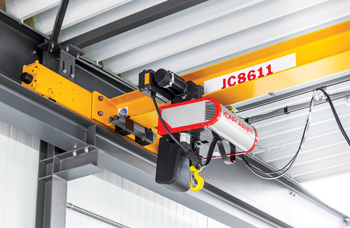 Konecranes has enhanced its portfolio of industrial cranes by introducing an upgraded version of the CLX chain hoist crane. The new- generation CLX overhead crane is mainly to be used for basic low-capacity lifting needs. The CLX chain hoist crane offers reliability, improved performance capacity, safety and easy maintenance. When lifting performs a major role in a production process, reliability and performance capacity are top priorities. The lifting capacity of the CLX chain hoist crane ranges from 500 kg up to five tonnes. Durable components and a number of technical features allow for hard use of the crane, but at the same time very smooth and accurate load handling. The stepless travelling movements and low speed suit tasks that demand accuracy, such as assembly work and mounting and lowering fragile loads. The faster speed reduces cycle time and offers greater productivity. In a lifting operation the brake of the chain hoist forms a critical part for product safety. The new magnetic brake of the CLX chain hoist has been designed for over a million operations. In practice this means the whole life span of the hoist. The brake and a slipping clutch overload device are designed to prevent the load from dropping or micro slipping in the event of clutch failure or an unexpected external hazard. The CLX chain hoist is provided with a compact full-aluminum frame the design of which allows easy access for maintenance. Konecranes global service network and spare part distribution support high duty performance and uninterrupted operation for many years to come. The upgraded CLX chain hoist crane is gradually introduced into the market and it is presently available globally with certain limitations. Konecranes is a world-leading group of Lifting Businesses, serving a broad range of customers, including manufacturing and process industries, shipyards, ports and terminals. In 2013, group sales totalled 2.1 billion euros. The group has 11,900 employees at 600 locations in 48 countries.